Desert anyone? This is a really easy recipe to grill bananas for a desert that is awesome with ice cream. Slice the bananas, in their skins, lengthwise. Drizzle the honey on the cut sides of the bananas and sprinkle them with the cinnamon sugar. 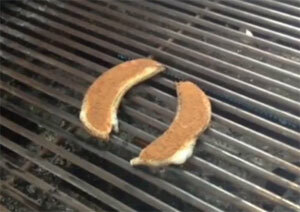 Place the bananas, cut side down, on the center of grill. Using a pair of tongs, turn them over and cook for 5 more minutes, or until the skin pulls away from the bananas. Remove the bananas from the grill and serve them immediately, on top of ice cream if desired.